Big families need space when they travel, and Shay and her group were immediately thrilled with how much room there was for everyone when they first stepped into the Crown Jewel. Members of large families know that privacy usually comes at a premium on trips, but not when you’re able to find a spacious cabin that can comfortably accommodate your entire crew with room to spare! Shay and her family also took advantage of the fact that their cabin was only a short drive away from downtown Gatlinburg and all of the incredible attractions located there. Even after a full day exploring the town they could get back in plenty of time to relax, enjoy the evening together, and get everyone ready for bed on time. 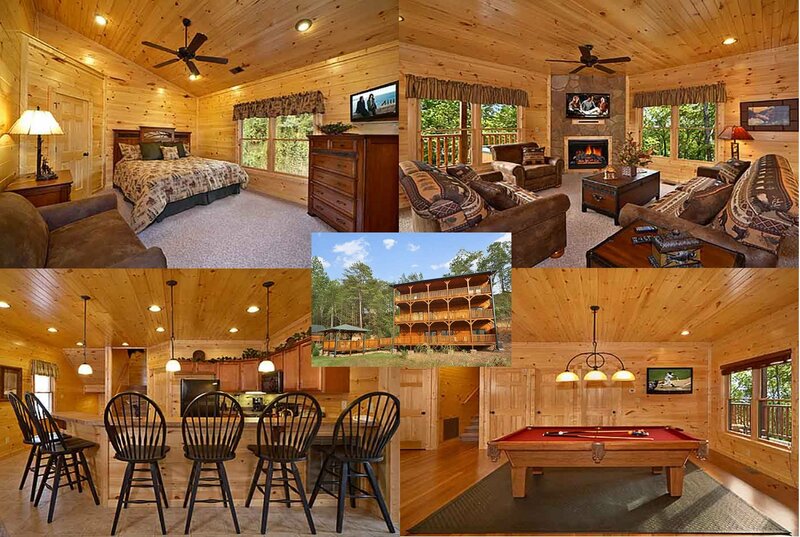 In our Smoky Mountains cabins, you can enjoy the feeling of being in the wilderness without being too far from great entertainment and dining opportunities. Anyone who has vacationed with young children knows that keeping them entertained during downtime can be frustrating and expensive, and that’s especially true when you have several little ones. One of the things that Shay loved most about the cabin was that it was easy to find plenty of activities to occupy the kids while she and her husband were busy with tasks such as cooking breakfast for the family or getting ready to explore the beautiful mountain surroundings. During their stay, it wasn’t odd to find several of the kids down in the spacious game room on the lower level, mesmerized by the pinball machine and arcade games or knocking some balls around on the pool table. The movie theater was obviously a big hit, whether everyone was settling in to watch a film or just to catch an episode of their favorite children’s show. And the older kids couldn’t get enough of the hot tub on the deck. Shay noted that vacation costs can mount quickly when you’re traveling with a big group, and the amenities in the Crown Jewel allowed them to save time and money while savoring the experience. They were able to minimize dining-out costs by preparing breakfast in the full-sized kitchen, and Shay could take care of all their laundry in a snap thanks to the washer and dryer included inside the cabin. Most of all though, she was happy to be able to share this wonderful experience with her family. When you’re trying to manage the schedules of that many people it’s tough for everyone to get away together, but Shay’s Smoky Mountains adventure with her family was well worth the wait. Whether you frequently travel with nine people or more like Shay, or you just like to explore on your own, Cabins of the Smoky Mountains has the perfect place for you to stay. Our well appointed cabins can be your base for experiencing thrilling adventures in Gatlinburg, enjoying a vigorous hike through the Smokies, or simply relaxing and taking in those gorgeous mountain views. To read Shay’s full post about her trip, check out her website: 5 Reasons Large Families Should Vacation at Cabins of the Smoky Mountain.